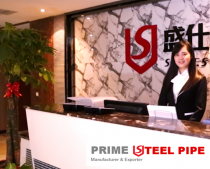 Hunan Prime Steel Pipe Co., Ltd is the export gateway of SHINESTAR HOLDINGS GROUP. We are dedicated in providing and exporting high performance-price ratio welded & seamless steel pipes and fittings covering various steel grades. At Prime Steel Pipe, we believe that honest communication, expertise in our industry, and prompt execution lead to strong long-term relationships. Our professioanl team provides ” one-stop procurement” servics to coordinate with your project regulation, site and terrain, and ensure the best quality of products by assigning skillful experts at every stage of production. Our principles is to keep the honesty in mind, to win reputation by trust. We strives to providing quality products, competitive price and value-added services to our clients throughout the world. SHINESTAR HOLDINGS GROUP is the leading manufacturer and supplier in China. Our company was established in 1993 and is primarily engaged in manufacturing, exporting, stocking, and trading of Carbon Steel Pipes and Fittings. We are proud to provide our clients with value-based, full-service solutions beyond supplying steel. We offer risk mitigation, cost containment, inventory management, and scheduling proficiency to contribute to our customers’ bottom line. SHINESTAR HOLDINGS GROUP has owned and invested 7 factories in mainland China, the total production capacity is 1,000,000 tons per year and annual sales has reached 1 billion. Besides, we has set up extensive international sales network covering Middle East, Southeast Asia, South Africa, Europe, South America etc. Today, we have already built up good relationships with clients over 30 countries and brand reputation all over the world.